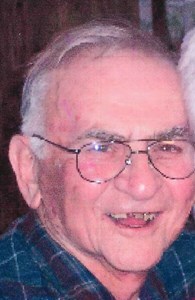 Robert F. Powell, Sr. 94, of N. Syracuse, passed away on Friday, at Elderwood at Liverpool, after a long illness. He was born on April 9, 1924, son of the late Philo and Hazel Powell. He served in the US Navy as a Radioman Second Class. Bob worked at General Electric and retired from Harris Company in Rochester. He enjoyed spending time with his family and the company of everyone. Bob will also be remembered for telling a good story. Robert is survived by his children, Robert F. (Linda) Powell, Jr., Susan (Jim) Mizener, William P. Powell, Linda M. Powell, 6 grandchildren, brother Donald Powell. along with nieces and nephews. He was predeceased by his wife, Norma, his parents, and his daughter, Sarah R. Causey. Visitation will be held on Wednesday, February 13th from 4-7pm at New Comer Cremations & Funerals, 705 N. Main St., N. Syracuse. Funeral services will be held on Thursday, February 14th at 10 am at the funeral home. Burial will take place at Oakwood Cemetery. To share a memory of Robert, or leave a special message for the family, please click the Share Memories button above. Add your memories to the guest book of Robert Powell, Sr..
Where the Love of our lost ones pours through and shines down upon us to let us know they are happy." Those words have helped me over the last 28 years and I hope it along with loving memories of your dad will comfort you and your family in the difficult days ahead. May God bless you all. I met "pops" years ago thru his daughter Sarah, when they lived in Penfield. I have often thought about the Powell family, and will forever hold them dear in my heart, "Mom", "Pops" and especially Sarah. May God hold each and every one of you tightly, and guide you thru this time in your lives. Our sincerest condolences to you and your family from Walt and Joan Bordett. Please accept the most heartfelt sympathies of the Liverpool Amateur Repeater Club, Inc. We hope the love and memories that you will forever hold in your heart bring you peace and comfort during this difficult time.